I think it's funny that these stories try to put a "new spin" on Megaman and Protoman and everybody when, if you've always been a Classic fan, you've always known that Protoman's story is a little bit tragic and that Megaman is basically a little boy that's also a war machine. This all seems like old news to us. I don't think Ian Flynn has ever claimed to be trying to put a new spin on the original tale. He's always done his best to be as true to the source material as possible. That said, not everyone's perception of the characters is 100% identical, and I think there's enough nuance in Ian's work to surprise even longstanding fans. Oh boy the last page has a guy on a green bike who wants to bet Proto Man calls him Green Biker Dude because Ian has an obsession for memes and references? This was a fantastic telling of Proto Man's story. Major props to Ian. Well, I've been a lifelong fan, so I already have most of the classics. (As much as I'd love to see the BN series on the VC, I've already got all 6, including the different versions.) It would still be nice for those who haven't had the chance to play these great games. Ah, the nostalgia... Now I feel like going back and playing them all again. 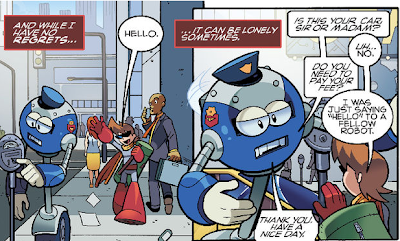 Why does blues has his buster and shades? Dr. wily gave him those when he remodeled him into a combat robot long after he ran away. It's because Wily assisted Light on Blues. They're aiming to acquire a military sponsorship, so he is equipped with Wily-designed weapons almost from the get go. This eventually led to the creation of the Sniper Joes. As for the shades; that pair is actually separate from the 'helmet with shades' that he later gets to assume the identity of Break Man. The timeframe of that additional remodeling (where he gets the nuclear core and shield as well) is a little bit off, but it works well for the comic as it tries to reconcile the old localized manual with everything else. You know, Zan, you and UDON should partner up for a book. Like a real legitimate source book. You'd think a society with autonomous robots would have autonomous parking meters that don't need an officer/robot to check for violations.